You know the feeling when you’ve just hung up from that 2 hour long conversation with your best friend back east, both of you hashing out how to live your lives on your own terms? Where the quiet relief that someone else understands you meets the inspiration and resolution to make you take that last leap of faith? The kind of conversation where after you hang up, you look in the mirror and see that both of your ears are hot and red because you’ve been so vehemently pressing the phone to your head exclaiming “Yes! That’s how I feel!”? Well that’s how most people feel after spending time with the music of Perrin Lamb. A songwriter in the vein of Damien Rice and Ray LaMontagne paired with British pop influences from the Beatles to Radiohead, classic melodies a-la the Eagles and Hall and Oates sprinkled with the country and gospel music of his childhood in Mississippi. Perrin is at once your best friend and co-conspirator when it comes to the business of pursuing your dreams. A young father, devoted husband and artist, Perrin sets his own struggles to music as he navigates the waters of real life as a musician in uncertain times. He doesn’t live in an old, romantic run-down farmhouse by the abandoned train depot, or a stark, concrete loft where the model next door peers forlornly at him through the curtains. He lives like the rest of us and jots down lyrics at the kitchen table while arguing with his toddler to finish her vegetables. His honest delivery of lyrics like “ It’s always wake, work, sleep, this may look like defeat, need a kiss to feel complete once in a while…” are an anthem for people who are making their way in the world, trying to provide for a family while holding fast to the things that make them feel truly alive. These sentiments are expressed in Perrin’s music through his ability to draw poetic inspiration from conversations with family, friends, and a community of young musicians to whom he has become a mentor, particularly in the realm of relationships. Lush and quirky arrangements lend to the emotion that Perrin builds throughout his songs while his vocals run the gamut from plaintively soaring, to an exposed, in-your-face approach at the forefront of the production. 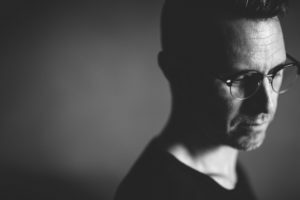 Of late, the emotions in Perrin’s songs have translated into fitting soundtracks for shows such as Army wives, Kyle XY, Grey’s Anatomy, the Real World, and The Hills.